"Nationally touring funky-folk poli-poetic singer songwriter/guitarist/pianist Anne Weiss has shared stages with Dar Williams, Ani DiFranco, Patti Larkin, Richie Havens, Cheryl Wheeler, Catie Curtis, Dan Fogelburg, Greg Brown...an extraordinary writer, singer, and not a bad mountain climber either." This album, my first, is continuing to be a favorite and has sold several thousand copies. Recorded live with remarkable musicians, including Dar Williams, Keith Greeninger of City Folk, Dave Keller of the Dave Keller Blues Band, Jofus of Funky Miracle, I am still very proud of this one. "Cherokee" is covered by a number of recording and nationally touring artists, as is "Day Of Celebration" and "Old Friend". Snowbound is frequently requested at shows. -Paul Kaza, Bulington Free Press, Burlington, VT.
to the most timely topical songs, she truly rocks." "Anne's been an inspiration to me ever since we met. She's funny, she's insightful, and the power of her performances brings people together in the best way". "Her voice is rich and powerful, with the ability to really belt it out, and yet it can be quiet, soft and clear, too. A lot of passion and soul...her songwriting is what excites me the most, though. The way she can say so much with such beautiful simplicity is what makes these songs really stand out." "Anne's distinctive voice, guitar playing, songwriting, humor and overall stage presence far surpasses much of the 'major label' talent of the 90's. Her new album, Crossing the Border, is a brilliant CD. I love the variety, arrangement, writing, singing, backup, and production. It just could not be better!". -Mike Myer, KRVM Radio, Concert Producer, Eugene, OR. "One of the freshest, most versatile voices I've heard...she ranges from folk to pop to swing to blues, all with a self-assured ease." "The new CD is terrific!" of all of her talents: poetic lyrics, tender melodies, tough guitar work, and magnificent voice. she makes effortlessly her own. What beautiful work!" 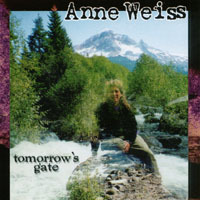 "Anne Weiss has brought heart and soul back into folk music. Her new release, Braille, is a great accomplishment." words flirty with the freedom and depth of the best poetry,and a vibrant voice, traversing easily from whispered intimacy to joyous gospel holler." For the past year plus this album has been my favorite gift to share with family, friends and all people I meet who need to feel inspired to live each day with intention. This CD brings me up and makes me want to be a better person, daily. If you like songs that detail a rich story and incorporate beautiful harmonies - then this CD is for you and for other's in your life! Anne's music is a gift to be shared.